We're making a move! 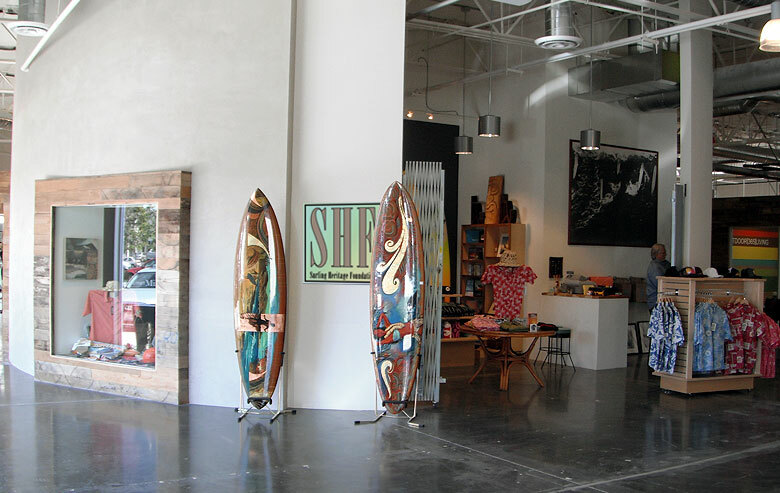 The Surfing Heritage Museum & Gift Store has moved from its location at South Coast Plaza West to its new home at The OC Mart Mix at SoCo. The retail space consists of a couple dozen, boutique style mini-stores, each with its own unique, design flavor. South Coast Collection, affectionately being called SoCo, is the only progressive shopping center of its kind in Orange County. With over 300,000 square feet of design showrooms and creative studios, SoCo offers the latest in a wide variety of trendsetting home furnishings and accessories as well as many other specialty retailers, all in one convenient place. The new store at SoCo will be operating on limited hours while site construction takes place (for now, Tuesday, Thursday, & Saturday from 10-4, we'll let you know once that changes). So bummed when we went to SCP today and store was closed. Luckily looked up on internet to see location had moved. Didnt see any information at old site pertaining to the move. They should have some up!